The Fourth Of July will be here before you know it, which means it’s time to reserve your backyard party rentals so you can throw the best Independence Day bash on the block. Signature Event Rentals has everything you need for your Virginia party from tent canopy rentals to tables and chairs. 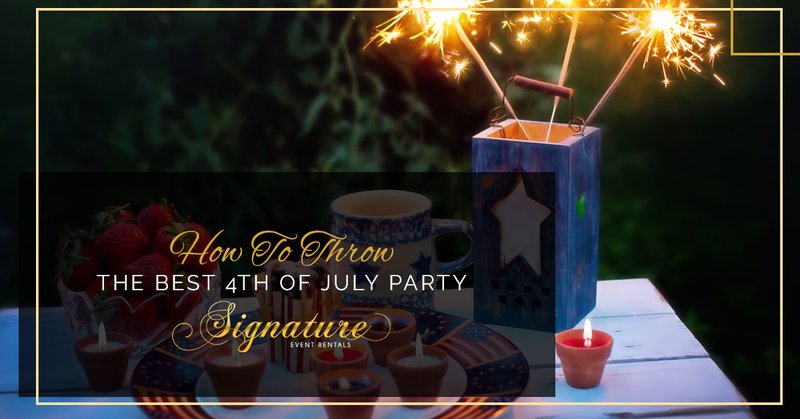 In today’s blog, we are going to offer up some ways you can take your ordinary backyard Fourth Of July barbecue to an actual Independence Day Party that will have your neighbors and friends wanting to come back again next year! The Fourth Of July comes at the peak of the summer heat, so giving guests a place to escape the sun is key to making sure everyone enjoys their day. Depending on the size of your backyard and how many guests you expect, we can hook you up with the white tent rental you need. Our canopy tents for rent range from a small 20×20 tent to a huge 40×100 tent. Obviously, one of the best parts about Independence Day is the food. There is never a shortage of good food when backyard barbecues reign supreme. You can’t go wrong with burgers and dogs, but providing tasty summer side dishes is equally as important. Cooking up a crockpot full of chili is a great place to start, but don’t forget to slice up some watermelon! Make sure your guests aren’t left searching for a place to sit. We can provide table and chair rentals so no one has to sit in the grass or try to eat their messy chili dog off of their lap. While celebrating our independence on July Fourth is important, it is also not surprising to know that this day is one of the biggest days for day-drinking in the country. Make sure to provide coolers full of beer and plenty of water so everyone remembers to stay hydrated. While you could bake cupcakes or order a cake, you can have those treats any day of the year. Instead, do something that most people don’t have that often, something that is a real “holiday” dessert. At Signature Event Rentals, we’ve got this covered, too. We can set you up with a cotton candy machine rental or a snow cone machine! Both desserts are a hit with kids and adults alike, so you really can’t go wrong. The Fourth Of July is definitely a family-friendly holiday, so welcoming your friends’ kids to the barbecue is expected. While you could set up a “kids table” with coloring books and puzzles, we all know that the little ones are going to want to run around in the sunshine. A rental bouncy castle is a perfect way for kids to entertain themselves while the parents mingle. Let them bounce off all of those sugary treats while you and the other adults enjoy the fireworks. Just make sure they have an adult supervising them! As you can imagine, summer holidays are busy times here at Signature Event Rentals, so be sure to reserve your party rentals as soon as possible! When you choose us as your party rental vendor in Fredericksburg, VA and Washington D.C., you can count on us to be there on time and for our crew to safely set up any rental tents, bouncy castles, and other items that require professional set-up and take-down. Get in touch today to learn more, and reserve your party rentals today!